With this weekend being the end of summer, it is finally starting to feel like Fall! Although, I love warm weather, it's nice to see the seasons change and be able to enjoy cooler nights. I have always been a huge denim fanatic! Printed, different washes, various trims. You name it, I own it or am currently lusting over it! As soon as I found these black and white floral skinnies, I knew they were going to be a fall staple in my wardrobe. There is something so chic about black and white and it's a combo that I seem to always gravitate towards. I paired my printed denim with an over sized blouse with leather piping and accessorized with mirrored sunnies and a mohair clutch. Hope everyone had a great weekend! Leather is the new denim. It is not only going to be a huge trend for this upcoming Fall season but it is such a versatile piece. It has become my go-to uniform and below I show you how it can be styled in three different ways. In addition to leather, cropped tops are also trending in every category, ranging from t-shirts and woven tops to knits and sweaters. Although the cropped sweatshirt can make an outfit casual, adding a touch of edge with the leather mini skirt can take this outfit from day to night. I added a reflective clutch with a bold lip to play up the leather more and add some shine. My obsession with graphic tees is growing everyday. Although graphic tees are more summer wear, you can transition it into fall by adding a leather skirt with any outerwear pieces. Here, I took it one step further with my smoke eye makeup to give this outfit more of a grunge rocker look. 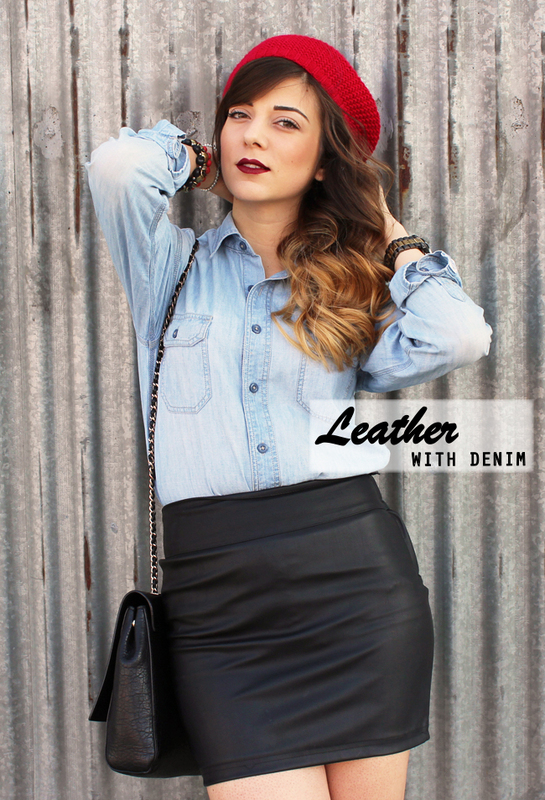 I love using denim as a contrast for my dressy, edgy pieces in my wardrobe. I've worn this chambray top with denim before but here, I wanted to pair it with leather to make it more playful with different textures and fabrications. 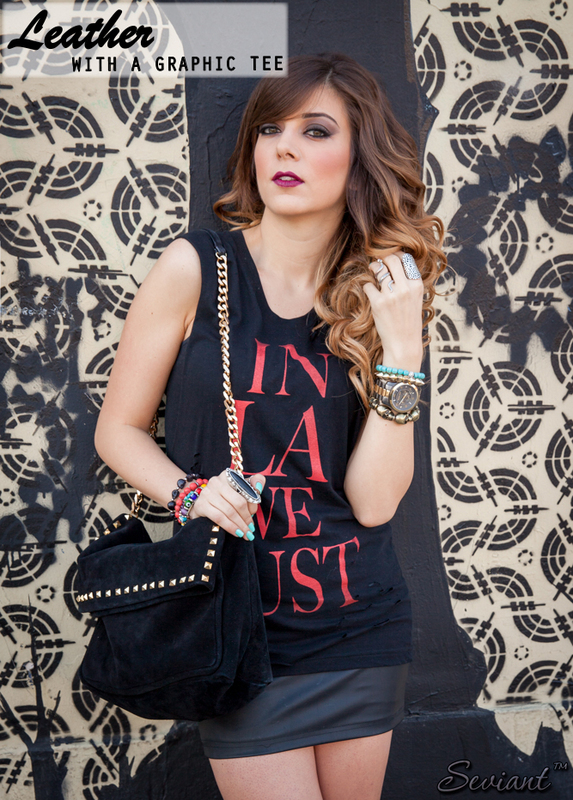 Pairing it with a pop color accessory can take any outfit and add a fun factor to it. Here, I paired it with a red beanie making it a perfect transition for fall. Which is your favorite look? 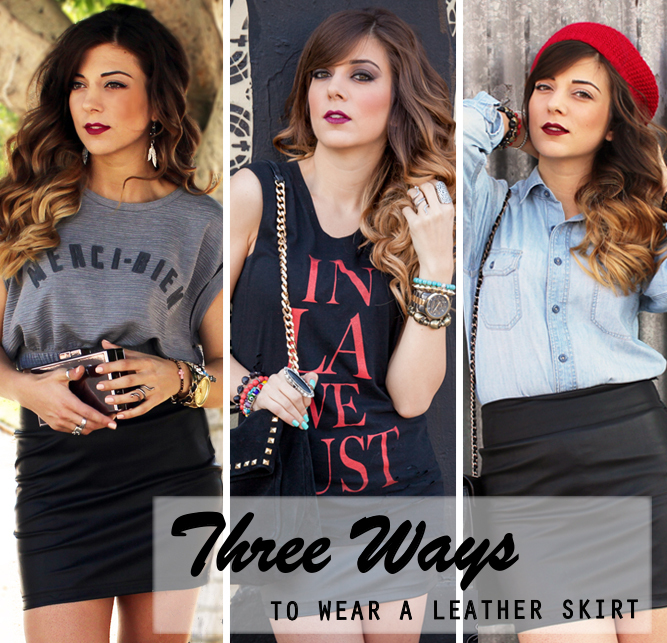 How would you style a leather skirt? It seems as if every time I start to get back into a normal routine, I get sick! I have been missing in action completely because I got sick last week and have been recovering since. I finally feel better and it's also starting to cool off in L.A.
Yellow has always been a favorite color of mine and when I saw this blouse, I knew I had to have it. With the temperatures dropping, I was finally able to wear with my vintage Levi's for a Sunday fun day with the family. Thank you everyone for your continuous support and love!